An awareness of the signs of strong health in rabbits is important, whether you already have a lovely bunny in your life or are considering purchasing one from a reputable breeder. Rabbits often provide lots of clues regarding their well-being, whether through their eyes or their overall behavior. Identify signs of health in a rabbit by looking closely at her, from head to toe. Clear and watchful eyes often are indicators of health, as are lustrous fur, clean claws, clean teeth and discharge-free ears and noses. Consistent, steady breathing is also often a prominent sign of health. Rabbits that are in good condition also generally do a lot of nose twitching. When they're healthy, they're typically extremely energetic and curious -- and they show it through doing a lot of investigating of their surroundings. If a rabbit seems nimble and relaxed in her motions, it often signifies glowing health. Looking for signs of health is important, and at the same time, it's also important to keep your eyes open for signs of malaise and possible medical conditions. Unhealthy rabbits often have lackluster eyes that seem to be looking off into no particular direction. Their coats are often coarse and messy. They may seem hesitant to move. Antisocial behavior is also prevalent in unwell rabbits, whether toward fellow bunnies or toward humans. Missing clumps of fur, persistent fur knots and skin lesions also all point to potential health issues. Other key signs of possibly sick rabbits are hobbling, abnormal bleeding, shifts in weight, diarrhea, zero appetite, noticeable leaning of the head, skin flaking, whimpering, salivation, crouched over stances, excessive sleeping, protruding bellies, breathing with their mouths ajar, blood-tinged urine and grinding of the teeth. If your rabbit is giving off any signs of a possible health condition, take her to the veterinarian as soon as possible. 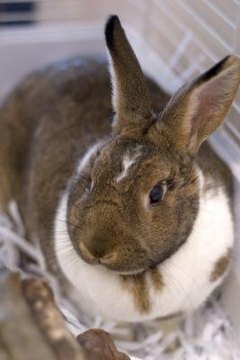 Rabbits experience a wide array of health issues, including but in no way restricted to bacterial and fungal infections, urinary tract disease, pneumonia and parasites. It's extremely important to schedule regular veterinary appointments even if your rabbit isn't exhibiting any hints of illness. Remember, as prey animals, rabbits naturally try to conceal signs of discomfort and pain -- a means of not coming across as weak and fragile to lurking predators. Touching a rabbit sometimes can be indicative of the furry critter's current health. If you touch a rabbit only to notice that she seems especially irritable, it could simply mean that she's suffering and just doesn't currently have the ability to act like her normal, jovial self. Note that uncomfortable, sick rabbits sometimes resort to biting the people who touch them. Keep children and other pets away from "under-the-weather" bunnies. Which of the Five Senses Do Rabbits Depend on the Most? Why Do Rabbits Hit Their Paws Together?